Mr. Alan Larson, Science Teacher with Samah Rash receiving her Science Award. 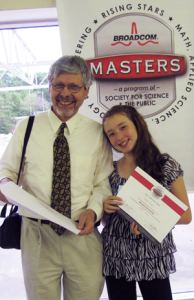 She presented her study at the Lynchburg Science Fair and received a from the Broadcom Masters Award, a program of the Society for Science and the Public. The national science, technology, engineering, and math competition for U.S. 6th, 7th, and 8th graders, the Broadcom MASTERS (Math, Applied Science, Technology, and Engineering for Rising Stars), a program of Society for Science & the Public, inspires and encourages the nation’s young scientists, engineers and innovators. Daily watering eight times for 6 minutes resulted in more mass gain than four times for 12 minutes or two times for 24 minutes. Sprouts are a healthy, nutritious, inexpensive, local and green way to supplement a healthy diet. There are many options for growing sprouts: Some are expensive and others are very inexpensive. Some require a lot of attention and others are easier. 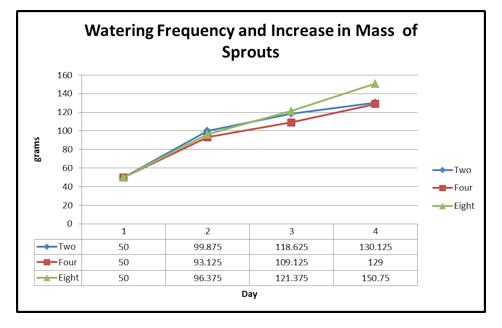 The results show an increase in sprout growth with increased watering frequency. It also showed good results for watering frequencies from 2, 4 or 8 times daily are all adequate. One time a day watering leads to problems with mold. An expensive sprouter able to water more frequently will produce the most sprout growth. Simpler sprouters will do almost as well and may be the better choice. Sprouts have been around for centuries. The first mention was in 2939 BC by the Emperor of China. They have a history of being a source of nourishment when times are hard. They were used by Captain Cook to prevent scurvy. It is my aim to shed light on one aspect of growing sprouts which is critical in choosing a successful sprouting method. Just how important is the frequency of watering sprouts to their growth? I found claims for a variety of methods watering three to eight times per day. One of the articles stated that they found three times a day using jars to be the best and another that eight times per day is superior. There was no study to back up either claim. Knowledge of watering needs for sprouts could lead to design of a convenient, inexpensive sprouter. This could fill a need for people who need a healthy diet for a low cost. Sprouts watered at an three hour intervals will show an increase in mass superior to sprouts watered at six and twelve hour intervals. With the help of my teacher (Allen Larson) I built an automatic sprouter. In this way I could control the intervals with an electric timer. The duration of the watering cycle was adjusted so each trial received the same amount of water. That is daily: two times for 24 min. , four times for 12 min., and eight times for 6 min.. Four trays containing 50 grams of brown lentils were used each trial. The trials were consecutive. Record of sprout mass in grams was recorded daily. We ran several pre-trials to refine our method. I did not have a prediction. 4 trays (7.5 cm x 5 cm by 30 cm) with 5 2 mm holes on each end for drainage. Storage container (35 cm x30 cm x30 cm) with two 1 cm holes for drainage on one end. And a pipe assembly to hold the cover up. Four misting nozzles spaced 7.5 cm apart plumbed to be a part of the lid and spray on the sprout trays. Sprouter timer set to water for required daily frequency and duration. Load four trays with 50 grams per tray. Set trays in sprouter angled with the end toward the nozzles down to the bottom of the container. For the next three days record the mass of the sprouts at the same time. To find the mass, take tray 1 and empty it into the strainer, shake and daub off the water, wipe off the tray, set the tray on the scale and zero the scale, remove the tray and carefully put the contents of the strainer back in the tray, then replace the tray on the scale and record the mass. Do this for tray1, tray 2, tray 3 and tray 4. Enter your results onto the computer; each tray will have four entries: 50, x, y, z..
Graph the result for each trial using 3D column graphs. Average the daily results for each trial and compare all trials using a line graph. The results showed that the brown lentil seeds increased in mass from 50 grams to an average of 132 grams. The average mass total for each trial condition increased as the frequency of watering increased. The masses: 129 g., 132 g., 135 g. corresponded to: 2 times daily, 4 times daily, 8 times daily. I found that sprouts in trays on the edges often had less mass gain. I would make a better way for the trays to be exactly placed. Also, I would buy all new nozzles. I did not do a control for temperature. This may have had some influence so I would get a high-low thermometer to check the consistency. I ran additional trials in April to check if there was a difference. During pre-trials I found the scale could be unreliable if you added a bit at a time. I developed a way to zero the scale with just the tray and then remove the tray and put the seeds into the tray all at once and then weigh the full tray. Also during pre-trial I found that removing excess water using a kitchen strainer gave more reliable results. I could have used more or less water by doubling or halving the time. I could have added another day to the trial. I was hoping they would all have the same mass gain. This would make a case for the simpler sprouter which could be less expensive. The difference wasn’t that much though. I could have counted the number of seeds which had a root of 1 mm or more. Perhaps there are advantages in terms of germination. Maybe use 100 seeds per tray and keep track of per cant germinating. Other varieties of seeds could be used. I think the most important result is that very simple watering frequencies work almost as well as complicated ones. This means that inexpensive sprouters can be developed for use to help feed people in need economically.